How do elite fighter pilots ensure the consistent success of their high-stakes missions? With a carefully honed process that leaves little room for surprise. With MISSION 360, we bring these same techniques to financial professionals who are no strangers to high-pressure situations. With MISSION 360, you'll learn how elite fighter pilots use a simple briefing and debriefing process known as the Feedback Loop. While financial professionals may not fly tactical missions into combat like a fighter pilot, you can apply these same techniques to execute on key missions that are critical to your practice. AB: Anyone remember where you were the morning of September 11th? It’s instant isn’t it? So there I was the morning of September 11th 2001, CEO of my own business, F16 pilot in the reserves. I'd spent the previous 15 years of my career training and preparing for how I was gonna deploy my F16 thousands of miles away and suddenly, September 11th hits and my world changes like that. Whether it was the week I spent in New York or the nine months when we were flying homeland defense over the skies of California, every day I came in the squadron it felt like there was some new intelligence briefing. This is the power of the training and the standardization that you can plug and play people anywhere in the world in the most demanding circumstances and get them up to speed and executing at a high level very quickly. And so I want to introduce to you what I call is a feedback loop of regular briefing and debriefing. Whether you're a financial advisor, whether you're a wealth manager, whether you're in retirement services, the fighter pilot principle of a feedback loop will apply in all aspects of your business. I can almost guarantee you that if you will make time to brief and debrief, not only will you improve your execution, you'll improve your client results, and I think you'll grow your practice. Graphic: Improve your execution. Improve your client results. Grow your practice. When fighter pilots get ready to fly any kind of mission, whether it's a one hour training mission or a six-hour combat mission, even though we've been preparing for these missions for hours, or in many cases we've been preparing for these missions for days. Just before we get ready to take off…fighter pilots always sit down and hold a briefing. Briefing is the time when the preparation stops and the execution starts. Graphic: Preparation stops. Execution starts. When we're briefing, the plan is fully baked and we are now shifting gears to say, “here's how we're gonna execute the plan.” Think about a quarterback in the huddle. We’ve been practicing this thing all week. Here's the play, here's how I want you to execute, here's when we're gonna start, here's what we're gonna do if it doesn't go right, ready break, let's make it happen. So, in my world, as goes the briefing so goes the mission, and I would argue in your world, as goes the briefing, so goes your day, so goes your week, so go your meetings and certainly so go your client events. Debrief assumes the fact that no fighter pilot's ever flown the perfect mission and I think it's fair to say that there's never an advisor that's gonna have the perfect day, week, or meeting. In a fighter squadron, debriefing time is standard, we always debrief 30 minutes after the last airplane lands. Graphic: Debriefing time is standardized. For advisors I believe the best practice is immediately following the meeting you move into the conference room next door and just hold a 10 minute debrief to talk about what worked, what didn't, and how we can do just a little bit better or differently next time. Debrief's not a performance review. Debrief is quite simply a sacred learning environment. Graphic: Debrief is not a performance review. It’s a sacred learning environment. The debrief is a really wonderful way to create clarity and transparency in any business. By applying the feedback loop in advisory business, you will find that you develop a culture of continuous improvement. Never resting on our laurels, always finding a way to get better. By standardizing the way you do business, by not having to reinvent the wheel every time, I think you'll find that you’re operating in a much clearer environment. Your team is much more aligned and understanding of how you're trying to execute. Building briefing and debriefing into your business will definitely fuel a culture of excellence and help with a purpose-driven motivated workforce. Graphic: Implement the feedback loop technique in your practice with briefing and debriefing worksheets for financial professionals. Available exclusively through Charles Schwab Investment Management. Call 877-824-5615. With a straightforward lineup of core products and solutions for building the foundation of a portfolio, Charles Schwab Investment Management advocates for investors of all sizes with a steadfast focus on lowering costs and reducing unnecessary complexity. The MISSION 360 program is for educational purposes only and implementation of the program does not guarantee future results for the advisors or clients. Anthony Burke and Mach 2 Consulting are not employed by or affiliated with Charles Schwab Investment Management, Inc. (CSIM) or its parent company The Charles Schwab Corporation (Schwab). The views expressed by Major Burke may not necessary reflect those of CSIM, Schwab or their other affiliates. ©2018 Charles Schwab Investment Management, Inc. All rights reserved. Are you fit to fly? Approaching your missions like a fighter pilot can help increase your chance for success and help improve your client experience. Our MISSION 360 toolkit is designed to help financial professionals quickly put the Feedback Loop to work. MISSION 360 materials, including editable worksheets, are exclusively available through your Charles Schwab Investment Management representative and/or by calling 877-824-5615. 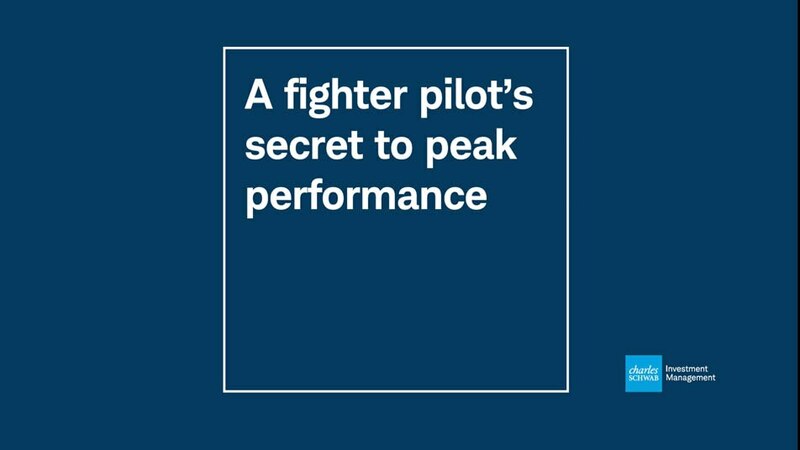 Our educational presentations can help financial professionals apply the same techniques used by elite fighter pilots to improve execution in their practice and the client experience they deliver. To learn more about MISSION 360 and our educational presentations, or to request MISSION 360 materials, please contact your Charles Schwab Investment Management representative or call 877-824-5615. Access resources developed for institutional use only—and subscribe to receive our latest news and insights. Anthony Bourke and Mach 2 Consulting are not employed by or affiliated with Charles Schwab Investment Management, Inc. (CSIM) or its parent company, The Charles Schwab Corporation (Charles Schwab).